Hayes & Yeading United were beaten by two first half goals for Histon who successfully snuffed out any chance of a comeback in the second half. A header from Nathaniel Knight-Percival and Josh Simpson capitalising on hesitant defending was enough for Histon to take all three points and pull away from United in the Blue Square Premier table. United manager Garry Haylock had a full squad to choose from aside from the injured Sami El-Abd and he chose to line up with a 4-5-1 formation with on loan striker Sean Canham leading the line on his own. Meanwhile, in defence, new England C cap Tom Cadmore returned to captain the side and Danny Allen-Page was given a start after serving his one match suspension. Things began positively enough as Adam Green's dipping free kick forced a good save from Danny Naisbitt in the Histon goal. But in the eighth minute, Knight-Percival popped up at the far post to firmly head down into the corner of the net. 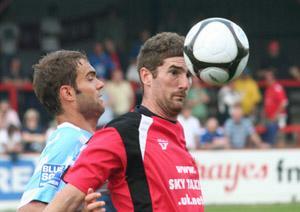 This heralded a purple patch for Histon as they hit the woodwork twice in quick succession. First, Michael Frew's header came back off the post and Tom Cadmore cleared. Then, Frew turned the ball into Jamie Barker's path and the attacking midfielder raced through before hitting the foot of the near post with his shot. Hayes & Yeading managed to compose themselves but were unable to break down a well marshalled Histon defence, for whom Matthew Langston and Craig Pope excelled. Only another long range shot from Green following James Mulley's lay off came close to an equaliser, Naisbitt tipping his goalbound drive over. United's confidence grew as the first half went on, but chances were hard to come by, and it was Histon who were to score the next goal, out of the blue. United had a throw in which Danny Allen-Page took, but he gave Ram Marwa a difficult ball to control in the middle of the pitch. Marwa was dispossessed by Barker who slid the ball through to Simpson who finished coolly into the bottom corner. Histon almost added to their lead just before half time when Barker again got through, but Simon Overland managed to smother his shot. At the start of the second half, Dale Binns had a great chance to cut the deficit when Marc Canham and Marwa combined to provide him with the ball in the penalty area but he shot weakly at Naisbitt. 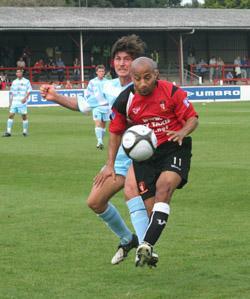 However, Histon were once again able to hold United's attack at arms length for long periods of the second half. Haylock changed the formation with a triple substitution to a 3-4-3 and half chances for George Daly (who headed narrowly over the bar) and Scott Fitzgerald (whose shot from a tight angle was blocked by Naisbitt) caused momentary alarm. However, the visitors were able to see the match out fairly comfortably leaving United still seraching for their first home win of the season.